Albrecht Dürer (1471-1528) was one of the most celebrated artists of his time. He produced some truly monumental works, one of the grandest of which was a ‘triumphal arch’ created for Holy Roman Emperor Maximilian I (1459-1519). 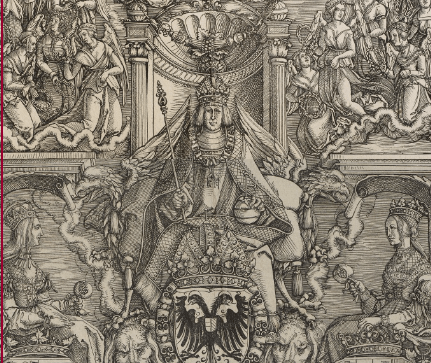 Dürer created several works for the emperor during his reign, but this massive print is probably the most impressive, at least in terms of sheer scale. 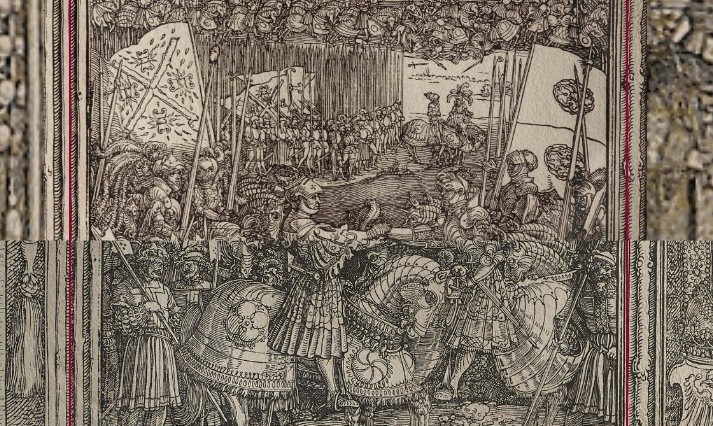 The image was created from 195 individual woodblocks and took almost three years to cut and print (1515-1518). The finished product was over 3.5 metres tall. Its form was meant to evoke the monumental arches commissioned by Roman emperors of antiquity, but rendered in paper rather than marble. It would have originally been intended as a form of wall decoration in one of Maximilian’s residences. Detail of a hunting scene. The arch is a testament to Maximilian’s ambition and his desire to commemorate his own reign alongside the Habsburg dynasty in general. The panels highlight events from Maximilian’s own life and also include a (grossly fictionalised) family tree. As a ruler, Maximilian was keen to memorialise himself in his own lifetime; he also wanted to ensure that he wouldn’t be easily forgotten by history. In order to accomplish this, he took a very hands-on approach to the works which he commissioned. Thus this triumphal arch includes some of the emperor’s favourite themes. For those unable to make the journey to view incredible pieces of history like this one in person, resources like the interactive display from the British Museum are invaluable. Here, you can explore up close and in incredible detail the intricacies of the arch. Alongside his military accomplishments, the emperor’s favourite pastimes of jousting and hunting, unsurprisingly, receive a place of prominence. 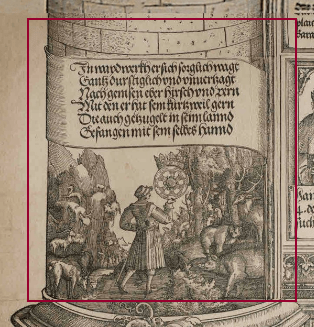 Always eagre to show off his social connections, Maximilian also made sure to include a representation of a meeting with Henry VIII of England. The two shared a passion for jousting and the tournament, with the younger Henry likely being influenced in his own court culture by the older emperor. Maximilian’s marriage to his first wife, Mary of Burgundy, is also the focus of much attention. Mary, the daughter of Duke Charles the Bold, brought the substantial inheritance of the Burgundian territories to her marriage; in addition, she and Maximilian were, by all accounts, a match of genuine affection. After she died after only a few short years of marriage, Maximilian married Bianca Maria Sforza of Milan. Poor Bianca Maria, however, does not receive much attention in the triumphal arch. Instead, unmissably placed in the very of the work centre sits Maximilian flanked by his first wife, Mary, on the left, and – in the place where you might expect to see his second wife – sits his daughter-in-law, Juana of Castile. However, the little details which can be found between the commemorative panels are worth a closer look as well. 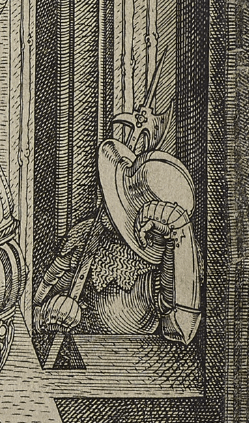 Exploring the margins of this massive print reveals humourous additions, such as this man-at-arms, caught in the middle of a cheeky nap. Like the marginalia of medieval manuscripts, there is much to be gained by reading between the lines, so to speak, of this epic printed work.